They had fun. The snowman didn't last very long. He fell within an hour or two. Our snow is mostly gone now. It didn't take long at all, which is my type of snow. We got more than 7 inches of snow today! Seven! Where we live! Once we had about 4 inches of snow out, we met some neighbors and their kids for a little sledding down the hill. This little guy was the only one of us with proper snow gear, thanks to us buying this for Little Elvis when we lived in Virginia. He hated the snow gear. It was so hard getting him into it! And it was also hard getting him into the fun. He did enjoy the taste of the snow, though. Once we finally got him to sled, he didn't want to stop. Baby Plum had fun sledding. He had to be talked into it. And he's usually my most adventurous boy. Little Elvis had a blast. He's usually my least adventurous, but he took off sledding as soon as we were ready. Bob finally took Cheese Puff sledding to show him how fun it was. It was a lot of fun! We plan on building a snowman tomorrow. Our baby is now 3! He's pretty proud of being three. He had a small birthday party. We invited 4 friends from his preschool class, and none of them came. They didn't even RSVP! But luckily, we have some friends back in the neighborhood now, and one of them brought her daughter. With his brothers, he had three friends. He was fine with that. It was a pajama party. I dressed in my pajamas, too. When my grandmother got here, she offered to snuggle with him while I got dressed! My mom got him a stuffed Mike toy. He loves stuffed animals. We made little Mickey Mouse cakes, because it worked last year. He didn't care. He needed a little help blowing out his candle. Little Elvis was happy to step in. He loved his presents! My aunt got him a little game that he adores. We play it in the morning... in the afternoon... at night. He also LOVES matching games. Any type of memory game is good with him. He likes to sit with me and Baby Plum in the afternoon and watch us play Old Maid and Uno before Daddy and Little Elvis get home. My grandmother got him a sweet little book. He likes it at night, when he's delaying bedtime. Look at that wild hair. We condition it like crazy, but it just frizzes up when he sleeps on it. My hair is straight as a board, and his brothers' hair didn't do this. I'm at a loss. We keep trying. He does not like me touching it when it's all frizzy. Our neighborhood friends got him a ninja turtle that he loves. Notice something missing from the pictures? Now that he's three, we're only letting him have his pacifier at night. He pitched a huge fit for a few minutes on Monday morning, and then cried a few times throughout the day. Yesterday he only asked for it a few times. Today, he didn't ask for it, except at night. Wish Baby Plum's thumb was so easy to take away. This baby is sweet, and extremely snuggly. He still likes to snuggle, and I love that. He's extremely chatty, and can be outgoing, although not really with adults. He loves music and shakes his booty all of the time. He's funny. Tonight, Bob pulled Baby Plum's thumb out of his mouth. Cheese Puff scolded Daddy, and told him that he was being "ug-oo-ee." It was very cute. He still likes for me to sing to him at night. His brothers were both out of that by this point. His current favorite is "Close to You" by the Carpenters. He calls it "Why do birds?" He loves this song, and wants it every night. It's sweet. I'm not sure about his other favorites. He loves macaroni and cheese, corn, peas, most types of fruit, Cheerios, oatmeal, chips and pizza. He used to eat supreme pizza, but now he only eats cheese. We all love this sweet little snuggle boy. Cheese Puff turns "free" on Sunday. He's already been prepping. This fit? Mommy wouldn't let him wear pajamas to Baby Plum's class Valentine party. I won that battle, but he's winning the war. He spends most of his time in pajamas. When allowed to wear PJs, he's pretty sweet. Hence, Mommy letting him wear them whenever he's not going to school or a school party. He had his class birthday celebration on Wednesday. His two older brothers had prepped me for this. You have to do store-bought at the pre-school. Big cupcakes are too big. Mini cupcakes don't get eaten either. They get thrown away. I tried doughnuts for Baby Plum last year. They also didn't get eaten. Then last month, Cheese Puff had some powdered doughnuts and went nuts for them. So, I got powdered doughnuts. I'm not sure the teachers were impressed, until the kids actually ate the doughnuts! Only half of the class was there, but those boys ate his snack! Yay! A king of a trip! 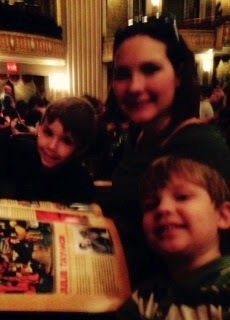 For Christmas, Gram gave the older boys (and me) tickets to see the Lion King! We've been very excited. In the week leading up to the trip, the older boys were not content to sleep in their room at night. We let them both sleep in our room (they move pretty easily once asleep) the night before the big trip. This is what we saw when we went to bed that night. We spent the night before the play in the big city. 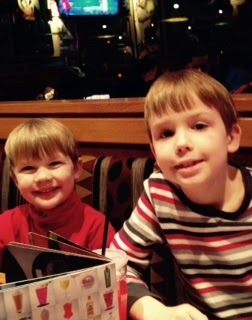 We ate out at Red Robin, a favorite of both my mom and Little Elvis -- they love the endless fries. Little Elvis barely ate. And he had one of his favorite meals in front of him. We found out why that night when he got sick. But luckily, it seemed to have been a one off. He felt much better by Saturday morning. My mom wanted to try a different old-timey burger place on Saturday, and he was up for it. He ate about half of his burger, and some of Baby Plum's chicken. He finished the burger on Sunday. We had them pose in front of the restaurant, which opened in 1912 I believe. We had time to wander around downtown, and got the boys to pose in front of the Hard Rock Café. They also posed with a cool looking tiger. There are lots of tigers around this city. There are also lots of Elvises... Elvi? Little Elvis did his best King of Rock n Roll impression in front of a big Elvis statue. See the cards in the boys' hands? A little girl gave them Random Acts of Kindness valentines. They said to pass them on. Little Elvis wasn't really into it, but Baby Plum carefully chose people to give the cards to, and then worked up his courage to actually give them. It was very sweet. And he made the day for several people. It was very sweet, and definitely like him. Gram posing with the boys after the play. Me with the boys during the performance. It was so great! The costumes were amazing, and super-cool. The actors were very talented -- even the kids. And it was a great experience. Little Elvis was definitely enthralled. Baby Plum was exhausted but kept rubbing his little eyes in an effort to stay awake. They had a great time. I told my mom that our upcoming presentation of the Aristocats would not be nearly as majestic. I'm a little biased, and I kind of tell my children that they are the cutest and the sweetest all the time. Probably not supposed to, but I do. Cheese Puff loves to hear that he's the cutest cutie-cute. And he really is. Poor baby was worn out the other day after much reading and game playing. It was actually afternoon, but Cheese Puff is a pajama type of boy. He wears them all of the time. Whenever he's not in school, he's decked out in pajamas. We just let him. Ok, can you see it? There's a tear in the corner of that eye. Why? He wanted to play the matching game that he wanted to play, but Baby Plum wanted to play a different matching game. Baby Plum asked first. They are both pain-in-the-bottom matching games. Pains because they have 48 cards for me to mix up, turn over and then place into some semblance of rows. He was recovering some there. Notice the different pajamas? They are his favorites. He calls them his super hero pajamas. They have the word Champ stenciled on the chest. No superhero. Whatever. That's his birthday party invitation. It's a Mickey Mouse pajama party. He invited 4 friends from school. I hope they are able to come. See how cute? He loves Little Elvis' helmet as much as Little Elvis. Baby Plum almost tried it on, but then changed his mind. He won't try it again. Little Elvis had his 8th birthday party yesterday. They spent most of the time outside. Even though it was February, the temperatures were in the 60s! Yay! When they weren't outside, they were in the sunroom. This is a better shot of them playing. Little Elvis went a little nuts listening to "Turn Down for What." It was a Lego party, but I didn't go all out on the décor. He loved the presents he got, and was actually very gracious. It was nice. We gave him a Mississippi State football helmet. It's not real. We bought him a white helmet on ebay, and bought Mississippi State stickers. It was just fine for him. He loved it! And was shocked. He had no idea he wanted it. He dressed in his football jersey (hand-me-down), football pants (hand-me-down from Coachpa) and his helmet that night. My parents gave him a cowbell. It's a Mississippi State thing. We're rednecks who ring cowbells at games. Another shot of his away game get-up. And so did Cheese Puff. I've been terrible about taking pictures. The boys are still cute. Little Elvis is finally growing some teeth to fill the holes he's had in his mouth for months. Little Elvis and Baby Plum both decided to try out for the Spring play! We were kind of shocked that Baby Plum wanted to, but we're doing "The Aristocats." I say we, because I'm a co-director of this play. It makes me nervous, and I hope I'm being helpful enough to the other co-director. The performances are at the end of March. Little Elvis will be one of the Aristo-kitties. Baby Plum's going to be an orange Alley Cat. We're all excited. Little Elvis' birthday party is this weekend. He's going to have a Lego party. I'm going to make cookies and a cake. The decorations are going to be minimal. I'm not planning games. We're just going to let them play. The boys helped me clean up some baseboards this afternoon, and they vacuumed our couch! I've learned that they like to be helpful when it's called, planning for a party. I will keep this in mind for Cheese Puff's party at the end of the month. The boys are excited about all of the things going on! I need to take pictures, though.